Calling out all Mustafar, Grace and Wendy! TODAY is your lucky day! 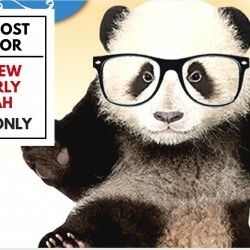 Hurry up to your nearest Boost store in Singapore to get your free Boost today! Don't forget to snap a picture with your Boost! Offer valid only on 20/10/2015 during local store hours. ID with picture must be shown at store to redeem your free Boost. Calling out all Matthew, Kimberly and Atiqah! TODAY is your lucky day! Hurry up to your nearest Boost store in Singapore to get your free Boost today! Don't forget to snap a picture with your Boost! Offer valid only on 15/10/2015 during local store hours. ID with picture must be shown at store to redeem your free Boost. Blended with Superfruit Booster! 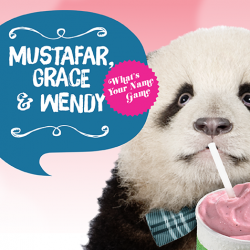 - Acai Berry, Goji Berry, Cranberry and Pomegranate and a berry blend. Jam packed with antioxidants! 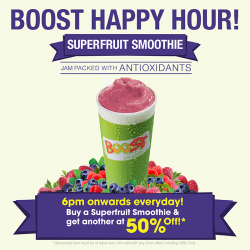 Superfruit Smoothie 2nd One For 50% Off After 6pm @ Boost Juice Bars. So, what are you waiting for? Hurry! 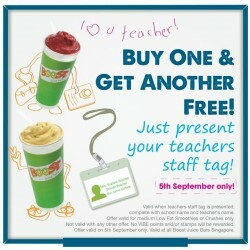 Enjoy and Buy a Superfruit Smoothie & get another at 50% off! BOOST’ed after a tiring day! From 6pm onwards, everyday .available for Superfruit Smoothie is a delicious mix of Apple Juice, Raspberries, Blueberries, Vanilla Yoghurt, Strawberry Yoghurt, Ice + Superfruit Booster! and more so hurry grab your self a great deal today! We did awesome for the SEA Games! It's time to celebrate! 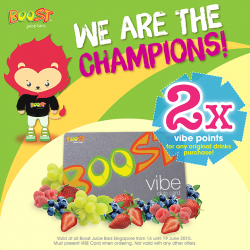 Grab yourself an Original size Boost & earn double VIBE points @ Boost Juice. From 16th till 19th June 2015. 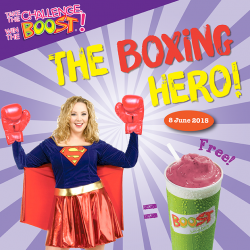 Enjoy and Come over in a FULL superhero costume with boxing gloves today, and get rewarded with a FREE Boost! We love health, We Love Life!. Boost Juice Bars have 10 stores now! To celebrate this amazing event, their Boosts are going off at a special price! 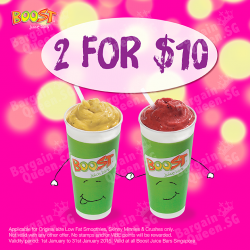 2 Boosts for only S$10! 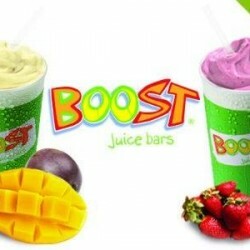 Get 41% off Boost Juice Low fat smoothies and Crushes! It's Monday and we're taking your Monday blues away! 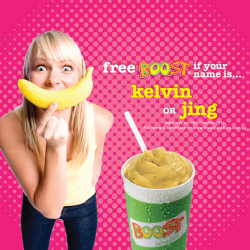 If your name is Kelvin or Jing, head into our stores today & flash your valid photo ID to claim your FREE Boost. Receive a FREE colouring book with every collectable kids cup purchase. 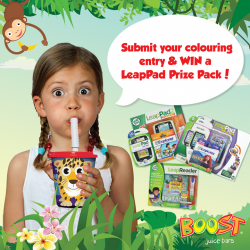 Take part in Boost Juice’s Kids Cups colouring contest for your chance to WIN amazing prizes! Teachers may not see the fruit of today's work but they have seeded a lifetime of knowledge. Happy Teacher's Day to all teachers! This is for you.